Growing up I never ate a thing called Korean ground beef, but I must say it smells like home. I'm not a person who can isolate different smells, but I guess beef + soy + garlic + something sweet smells exactly like home. This gets served with in a rice bowl with pan-roasted vegetable, or kimchee and avocado. Heat sesame oil over medium high heat in a saute pan. 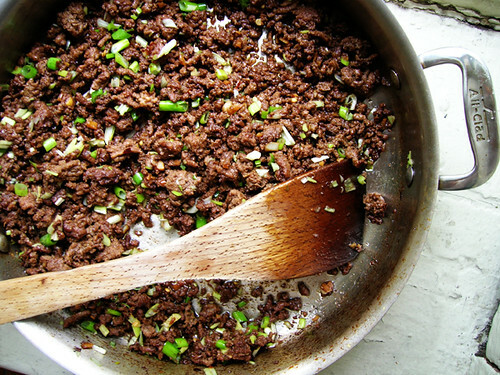 Brown the ground beef in the sesame oil, about ten minutes. Meanwhile mince the garlic and add it toward the end of browning the meat. Add red pepper, soy sauce, and molasses, stir and simmer over low heat for 20 minutes. Finely chop green onions and stir into the meat at the end of cooking.